572 pages | 75 B/W Illus. The Jews: A History is a comprehensive and accessible text that explores the religious, cultural, social, and economic diversity of the Jewish people and their faith. Placing Jewish history within its wider cultural context, the book covers a broad time span, stretching from ancient Israel to the modern day. It examines Jewish history across a range of settings, including the ancient Near East, the age of Greek and Roman rule, the medieval realms of Christianity and Islam, modern Europe, including the World Wars and the Holocaust, and contemporary America and Israel, covering a variety of topics, such as legal emancipation, acculturation, and religious innovation. The third edition is fully updated to include more case studies and to encompass recent events in Jewish history, as well as religion, social life, economics, culture, and gender. 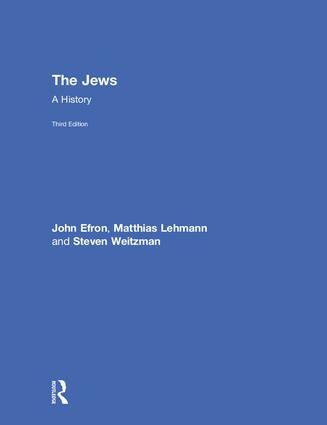 Supported by case studies, online references, further reading, maps, and illustrations, The Jews: A History provides students with a comprehensive and wide-ranging grounding in Jewish history. John Efron is the Koret Professor of Jewish History at the University of California at Berkeley. His specialty is the cultural and social history of German Jewry. His most recent book is German Jewry and the Allure of the Sephardic (Princeton University Press, 2016). Matthias Lehmann is Professor of History and Teller Chair in Jewish History at the University of California, Irvine. He has written about the history of Sephardic Jews in the Ottoman Empire and around the Mediterranean. His most recent book is Emissaries from the Holy Land (Stanford, 2014). Steven Weitzman directs the Herbert D. Katz Center for Advanced Judaic Studies at the University of Pennsylvania, where he also serves as the Abraham M. Ellis Professor of Hebrew and Semitic Languages and Literatures. A scholar of ancient Jewish culture and religion, his recent publications include a biography of King Solomon from Yale University Press and The Origin of the Jews: The Quest for Roots in a Rootless Age (Princeton University Press, 2017).